When a contract requires anti-virus on all computers, even the Mac OS X systems, which do you choose? One nice thing about working in a heavily Mac OS X environment, which most Ruby on Rails development companies are is that there just are not the number and variety of viruses on the platform as there are in the Windows environment. This is not to say that a Mac user does not face many security threats – they do face threats, nor that they cannot be hacked – they most certainly can be hacked. In fact, a review of Secunia’s Vulnerability Report: Apple Macintosh OS X is a good exercise here. All this said, Macs are just not commonly known to be affected by viruses in the same sense that a Windows or DOS computer has been. And some of this is the economics of virus authoring. However, as a Mac OS X user, I am not invulnerable and I am still required by contract to install and use anti-virus software. That such logs provide an audit trail history that is retained for at least one year, with a minimum of three months immediately available for analysis (for example, online, archived, or restorable from back-up). And yes, they will check on this. At the very least with a detailed assessment questionnaire that the company owner will sign or via actual audit. For any business, one of the most important security precautions is to never store credit card numbers – not ever. Using a gateway service with payment data tokenization, such as Stripe, BluePay, or even Authorize.net’s CIM is vital. It is best if your business never touches any customer credit card details, but such details are only ever entered by customers directly. However, if you ever take card details from a customer, such as over the phone, and then type that data into your invoicing software or merchant virtual terminal, then you have to pay attention to PCI-DSS. That last case is the situation that my own company is in. We do not handle a lot of credit cards, not like a brick and mortar merchant would. Therefore, we still have to take contractually mandated security precautions. Compiles a detailed log that is auditable and is maintained for at least a year. Next, I am going to review the two products that I am currently using in my own company. This is not meant to be a side-by-side guide of all products on the market with pros and cons of each. Feel free to research your options based upon these criteria to find out what’s best for your company. 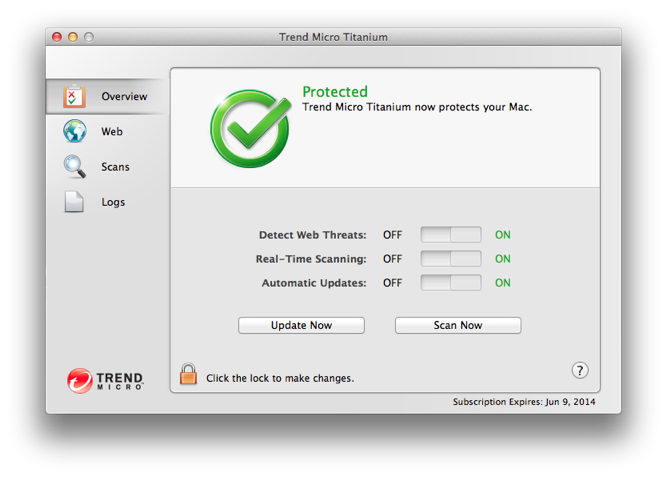 Last year, I took a look at several anti-virus applications, and ended up settling on Trend Micro Titanium for Mac OS X for my own systems. This is not to say that it is only option, but it has an inexpensive annual subscription and checks off all of the requirements. 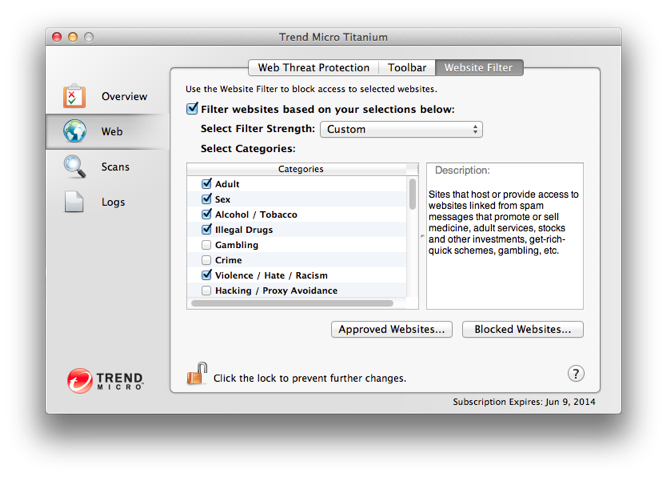 Once installed it can be configured to automatically detect known threats and update. It keeps a sufficient log, and by using the Customize filter, you can go back for a year or more. Be sure not to click the Delete button, which clears out the logs though. This is not strictly a PCI requirement, but is a good part of an information security program. ClamAV is an open source anti-virus platform that is very popular for use on servers that is available at http://www.clamav.net/. It normally runs as a command line tool and I like to install in through Homebrew on Mac OS X systems. If you are on Linux, then this is certainly available through your package manager. It has an automatic update daemon called freshclam and can be scripted to your hearts content. It’s really good and it really is more for a programmer or system administrator to setup. For a version with a graphical user interface, see http://www.clamxav.com. ClamAV is a wonderfully flexible anti-virus platform, but getting it setup is involved. 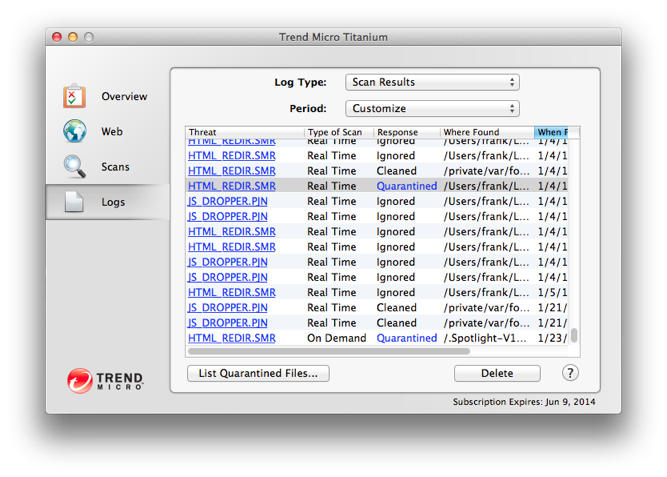 For my company, Trend Micro Titanium is a good overall anti-virus that is inexpensive, was on sale for $19.95/year/Mac at the time of this writing, and appears to satisfy the PCI-DSS contract requirements for occasionally interacting with clients’ credit card numbers. Anti-virus is one technical control that is implemented as part of a vulnerability management program, that is an important part of a comprehensive information security program. Your program should be multi-faceted with the aim of providing defense in depth and documented with a written information security policy. If you need to be PCI compliant, then know that there are many additional requirements that are beyond the scope of this blog post. This post is meant to be a general discussion of important topics and is not offered as legal or security consulting advice. The author is a security professional, but is not himself a PCI assessor.